Gallery of female quiet emotions for cosmetic make-up. If physiognomic symbol of a man or boy-friend is not known, or it is impossible to coordinate female emotions with emotional expressions of a male face, then visage designers and image-makers should create cosmetic make-up which does not contradict original facial displaying of a woman. Quiet eyes seem gloomy as eyebrows and mouth express sad emotions. 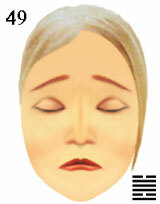 Sad eyebrows and mouth seem calm as eyes express quiet emotions. Covert eyesight is unhappy if sorrowful sensations are aggravated by gloomy reflections. Desires disappear if ideas and feelings are sad, as if intentions of the person do not exist in the world which is perceived by gloomy sensations and reflections. cosmetic make-up and quiet emotions of a woman.